Re-post: With the publication of Coin, I decided to repost the below 2013 post. 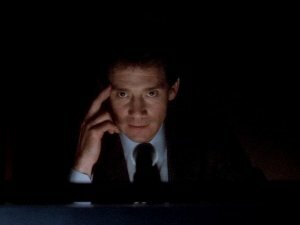 Anthony Andrews as the devious "psychic" in Columbo. 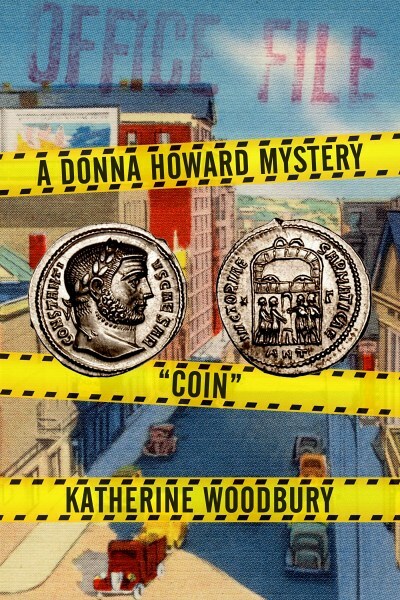 The main character of Coin, Donna, is an investigator with paranormal abilities. She is not--as she repeatedly attempts to explain--a psychic. Also, unlike so many literary and television psychics, she does not assume people should accept her "evidence" as empirical. The below post explains why. I love mystery shows. Unfortunately, this means that I have to endure many many "detective meets psychic" episodes. Nearly every mystery show has one or more of these episodes (I use the word "nearly" to cover myself, but really they all do). Even Numb3rs--Numb3rs!--caved and had a couple. It is very annoying, Red John annoying. Inevitably, the episode will be about how the tough detective/math instructor/profiler should accept that there is something else out there (cue religious or scary music). My problem is not believing in a supernatural/outside-our-ken mover & shaker. I've seen a number of detective-meets-Catholic-priest episodes that have this same theme or lesson. Shoot, the entire show X-Files is based on this theme and it doesn't bother me. The difference is this: usually, in a detective show (and X-Files) when the tough detective meets the priest/guru, the point is, "Okay, we solved the case, but maybe we don't fully understand the workings of the human mind or of the universe, etc." That's a very intelligent point whether one is talking religion or science: there may be stuff we don't know. In Numb3rs, this is almost always Larry's role--to remind Charles that his equations may not be able to capture the ineffable. But in episodes where the tough detective meets the psychic, the point is (almost always) that the detective should be open-minded enough to let the psychic help. I am not debating the possibility of stuff like ESP. I am doubting the use of the equivalent of interpretive dance to guide an investigation. Again and again and again, psychics in real life and on television/film inform us that psychics can't produce information willy-nilly. They have to be in the mood: their visions come and go; they can't promise definite answers; they can only interpret what they see or feel. 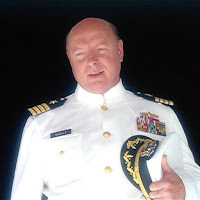 I read a book awhile back in which the author whined that the military gave up on ESP research because those awful rigid bureaucrats didn't understand all this stuff about moods and the haphazard nature of visions and interpretation. Whatever: if I were the military, I'd have dropped them too. I can just see some general standing on a field somewhere, missiles incoming, the enemy on the horizon, the H-Bomb minutes away from exploding, going, "Sorry, soldiers, we gotta give the psychic time to center himself." As for interpretation, as the waitress says in the non-psychic CSI episode "Rashomama,"
Likewise, psychic interpretations can be interpreted just about any way people want. 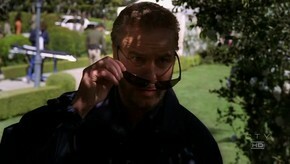 CSI's "Stalker"--the psychic is used to tell the story, not solve the case. Although he helps Nick in the end, he also complicates matters and even, possibly, pushed the victim to return home when she should have stayed in the hotel. He is a decent, well-meaning character. Confused and burdened by his "gift", he relates information not to change people's minds but because he feels compelled. Monk's "Monk and the Psychic"--the psychic is a fraud! She is also hilariously played by Linda Kash. Columbo's "Columbo Goes to the Guillotine"--the psychic is not only a fraud but a clever murderer played by the ever-clever-and-urbane Anthony Andrews (see above). Burton 'Gus' Guster:You named your fake detective agency "Psych"? Why not just call it "Hey, We're Fooling You and the Police Department, Hope We Don't Make a Mistake and Someone Dies Because of It"? Shawn Spencer: First of all, Gus, that name is entirely too long. It would never fit on the window. And secondly, the best way to convince people you're not lying to them is to tell them you are. That's just about it. The psychic episodes on Numb3rs--in which the psychic is played by the disturbing John Glover--are completely annoying and take the show out of reputable-if-occasionally-misapplied-logic territory to total silliness. The psychic episodes on The Mentalist would have been far more interesting if they hadn't been used to undermine Jane's credibility. The psychic episode on Criminal Minds was hilariously stupid (despite Cybill Shepherd), being of the "I sense water; the body must be near . . . a rain gutter!" variety. And there's more--there have been psychics on Murder, She Wrote; Diagnosis Murder . . . you name a mystery show, I can (almost) guarantee that a psychic has shown up at some point. I know Hollywood runs out of story ideas, but really people, give it a rest! Back to 2018: Donna of Coin isn't a psychic; she can't predict the future. And she doesn't rely on feelings or intuition to "prove" a case. That's lazy and as the ministers surrounding the Salem Witch Trials began to point out: in a case built on hearsay, anybody's version could be true. Instead, Donna uses her abilities to locate clues that can lead to empirical evidence--and if sometimes, there's a gap between knowledge and evidence, that's where an ethical person has to take a good hard look at herself. Just out of curiosity. What's the difference between paranormal abilities and being psychic?